You are here: Home / Grow / 16 Fruit Trees for Zone 3 with Great Tasting Fruit! 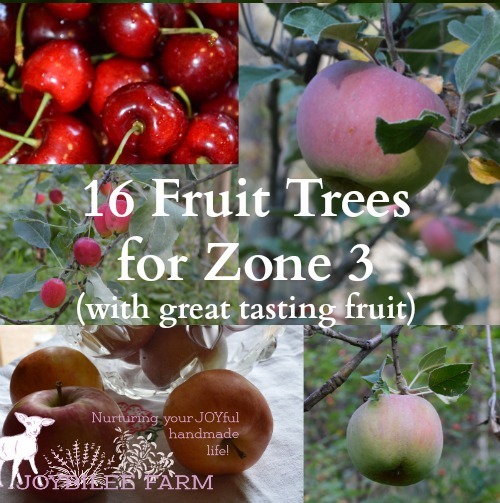 16 Fruit Trees for Zone 3 with Great Tasting Fruit! 100 years ago scientist at experimental farms all over North America started breeding programs for hardy fruit trees and small fruit that would thrive in the harsh winters of Canada and the Northern USA. It takes as much as 40 years to test cultivars for hardiness and taste. For every fruit that gets accepted thousands more are rejected due to poor yields, lack of flavour or texture, or lack of hardiness. Once a cultivar passes the experimental stages, it takes even longer to make it a commercial option that can be cultivated for farms and home gardens. Today we get to enjoy the fruit of those labours. Thank you to the hardy orchardists in Minnesota, Manitoba, Saskatchewan, and throughout the colder regions of North America for your hard work. Will it grow and make fruit where I live? First a word about “hardiness zones.” Hardiness zones tell you what the coldest expected temperatures are in a region. This isn’t the average winter temperature but rather the extreme of cold that your area experiences. It doesn’t give you information about the length of the growing season, the number of frost free days you can expect or even whether there is enough frost free season to mature a crop. It also doesn’t offer any information about summer heat units that are required to ripen a crop. You may need to live in a place for a while and keep records in order to gain this information. Typically a plant that is hardy to zone 3 can take winter temperatures as low as -40°F/-40°C. A plant that is hardy to zone 2 can take -50°F/-45°C. Zone 4 is winter temperatures between -20°/-30°C and -30°F/-35°C. While you may be able to grow plants that are classified as a zone higher than you have, in a test year you may lose your plants. Typically if you are growing plants that are rated for a zone higher than what you have, you will need to offer extra winter protection to those plants, to get them through the winter. Can you give the plant what it needs? When making a decision about what varieties of fruit and nuts to invest in, you need to have more information than just the plant hardiness zone for your area. What is the height and breadth of the mature plant? Can you provide it with enough sun and water for its needs? How long do they take to begin bearing fruit? When does the tree blossom – early spring, mid season, or late? If you are in an area that gets frost right till June, an early spring blossoming may not have any pollinators out when you need them. At what time is the mature fruit ripe? Can it take a frost? Some fruit actually improves after a frost. Fruit trees often fruit on the wood grown the year before. Winter die back will kill the fruiting wood and result in crop losses, therefore it is wise to choose fruit varieties that are rated for your hardiness zone. The second criterion when choosing a fruit tree for your land is does the fruit taste good? Will it serve the purpose you need it for, whether fresh eating, preserving, canning, or drying? Often fruit that is hardy doesn’t have the taste or texture to make it desirable. When you read about a berry plant and it says, “ornamental berries” this means that they are bitter, astringent, dry, mealy, or small and onerous to pick. Many wild berries are considered “ornamental” or “survival use only”. While named cultivars of the same species may have choice berries. Apples (Malus Spp) are the first tree people think of when they want to plant a fruit tree in their yard. There are thousands of different varieties of apples grown in North America, with a few choice cultivars that are hardy in zone 4. 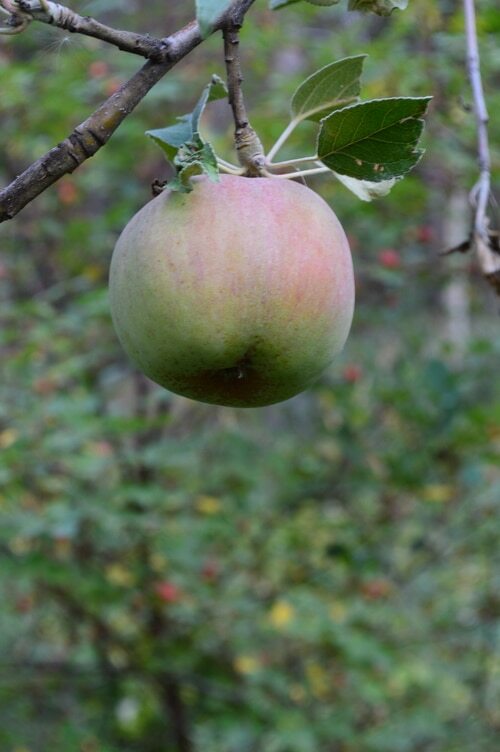 While grafting tender cultivars like Golden Delicious on hardy root stock can improve the survivability of the apple tree itself, fruiting wood of more tender cultivars can be damaged in test winters. 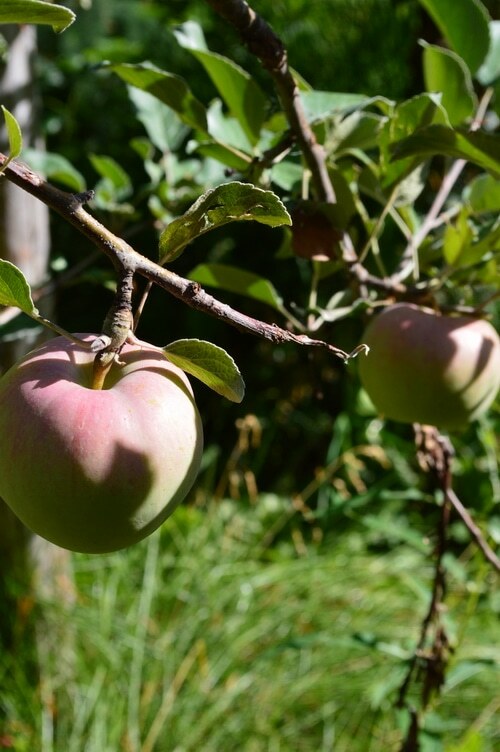 On the other hand, apple cultivars with proven hardiness are now available to the home gardener and orchardist. While this isn’t an exhaustive list, these are a few of the best tasting apples available for colder areas. The Goodland Apple will reach a height of 15 feet with a spread of 12 feet. It is red over pale yellow with some striping. The fruit is 7 to 8 cm, medium to large apple. It is a crisp, juicy apple with medium sweetness. Fruit ripens in mid August to September. Good for fresh eating, apple sauce, and fruit leather. It stores well. Hardy to zone 3, it bears fruit 3 years after planting. The Norkent apple has the appearance of the Golden Delicious, with a red blush. It has the distinct apple-pear taste of the Golden Delicious. Good for fresh eating and as a cooking apple. Norkent dries well. Its medium to large fruit ripens in early September. The fruit shouldn’t be picked early, as the flavours develop as the apple ripens on the tree. With the Norkent apple you’ll get fruit a year earlier than other apple cultivars. This is an annual bearing tree. Hardy to zone 2, it bears fruit 3 years after planting. Dutchess is a heritage apple and one of the few apples that will grow true from seed. It is hardy to zone 3. It was once the premier apple of commercial orchards in England. It ripens in early September. Dutchess apples are medium size, with a sweet-tart taste that makes it good for fresh eating, for sauce, and for cooking. It is not a long keeping apple and should be stored no more than 6 weeks. Hardy to zone 3, it bears fruit 5 years after planting. Dutchess is one of my favorite heritage apple trees and worth searching for. Dutchess of Oldenburg grafted on Russian Dwarf Rootstock. Sweet Sixteen has a very unique taste that is reminiscent of cherries with spice and vanilla cream. The fruit is medium size, crisp, and juicy. It is good for fresh eating and for cooking. Harvest in mid September. Sweet sixteen takes a little longer to bear fruit than other cultivars, often 5 years after planting. Hardy to zone 3b, and worth looking for. Sweet 16 on hardy Russian root stock. Very complex and sweet flavour. All apple trees need a pollinator that blooms at the same time. Crab apples tend to bloom longer than regular apple trees. A crab apple can meet your pollination needs. I grow the Dolgo crab apple, which are hardy to zone 3 – 7. Its tart fruit is large and can be eaten fresh, used in jam, preserves, or apple sauce. It adds a pink tinge to apple sauce and a deep burgundy colour to fruit leather. Prunus trees need a pollinator with a similar genetic background. Typical pollinators include Nanking Cherry, Sand Cherry, and Choke Cherry. The bark from the pollinator is useful for treating unproductive coughs and the fruit is usually good for jams and jellies, as well as feeding wildlife. “Sour” cherries are the type most adaptable for cold climates. They flower a little later than sweet cherries and so aren’t as damaged by late frosts. Though, the term “sour” refers to type of tree rather than the taste of the fruit, many of these cultivars have fruit that is sweeter than “sweet” cherries, when fully ripe. Cupid Cherry is a sweet cherry with a shrub habit. It grows only 6 to 8 feet in height on its own root system. The sweet, dark red fruit is 3 to 4 cm and 6.5 grams. This is from the “Romance Series” released in 2004 by the University of Saskatchewan. The tree is self-pollinating but you’ll need either two Cupid Cherries or a second cherry from the Romance Series for pollination. Cupid had the largest cherries of the Romance group. They are deep burgundy when ripe in mid-August. Hardy to zone 2a. The other cherries in the Romance group include Crimson Passion, Juliet, Romeo, and Valentine. All are hardy to zone 2. All are self-rooted and have a bush habit. The favors are good. The trees are picked more like a Saskatoon bush rather than a cherry tree, allowing for mechanical picking. Of these Juliet, Romeo, and Valentine are sweet and productive. 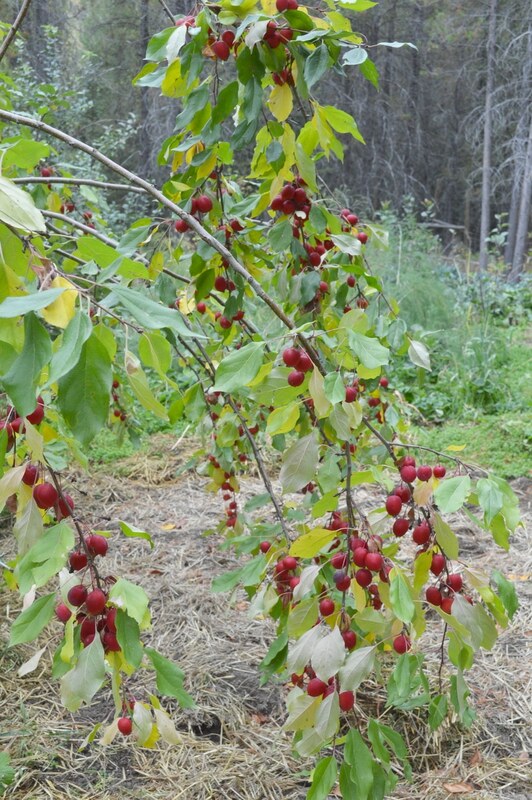 While Crimson passion is a moderate fruiting shrub with larger, sweeter cherries. 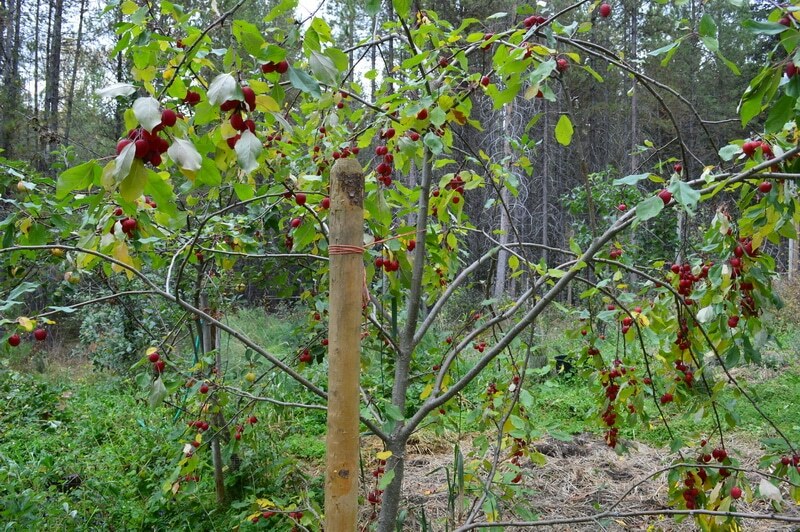 All these Romance cherries are self-rooted, so damage from winter dieback is minimized. These fruit shrubs are self-pollinating but for best results at least two trees should be planted. Evans cherry is a sour cherry with small bright red fruit. The tree grows to 12 feet on its own rootstock. The tart cherries are good for juice, drying, and cooking. The cherries ripen in late July. The cherries are on the tart side, with yellow rather than red flesh. Hardy to zone 3. Self-pollinating. Carmine Jewel Cherry is a shrub that grows 8 feet with dark purple, small cherries that have small pits and a tart-sweet flavour. 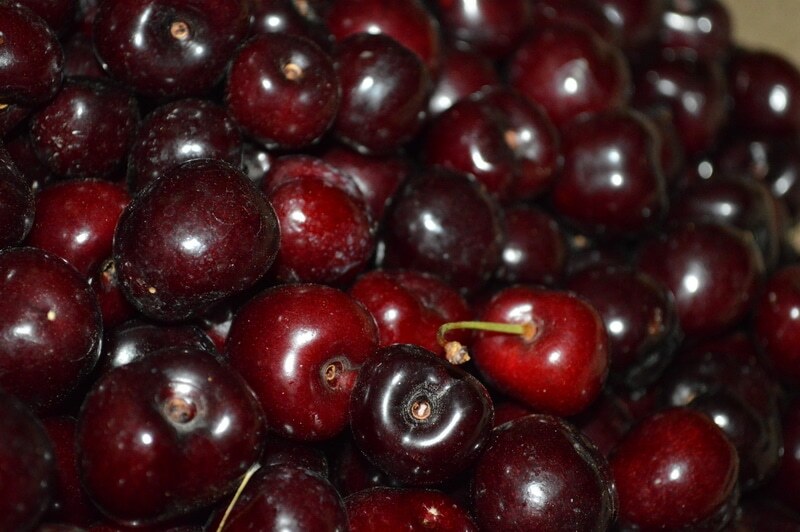 The cherry is good for fresh eating and is considered one of the best pie cherries. The productive tree ripens its fruit in late July to early August. Hardy to zone 2. Self pollinating. Plums are also of the prunus family, like cherries. But most plums require another tree of the same ancestry for pollination. Japanese plums require a Nanking cherry or another Japanese plum for pollination, for instance. Hardy to zone 3, Brookgold is a seedling of Japanese plum. The small fruit is gold and freestone. Good for both fresh eating and preserves. The tree grows to 12 feet in height with a spread of 12 feet. It blooms early for ripe fruit in August. Pollinate with other Japanese plums or Nanking cherry. Toka is a vigorous Japanese-American hybrid plum. It has red fruit a little bigger than a cherry, and full of fragrance. It is sweet and flavourful. The tree yields moderately well. It’s is a strong pollinator for other plums. It has abundant flowers in spring and pleasing red foliage in the fall garden. Hardy to zone 3. Waneta is the largest of the Japanese hybrid plums. It has been considered the finest American plum for over 100 years. The clingstone fruit is medium large with red skin and yellow flesh. It has a sweet flavour, suitable for fresh eating and preserves. The tree grows to 12 feet with a spread of 20 feet. Hardy to zone 3. Casino™ grows to 15 feet with a 15 foot spread. A hardy apricot with freestone flesh, with a pink blush, Casino™ ripens in mid summer. It is good for canning and for jam. Self-pollinating but yields will be improved with a Nanking Cherry nearby. Hardy to zone 3. Like Casino™, Westcot is of the Manchurian/Siberian apricot group. It grows to 16 feet with a spread of 12 feet. Westcot ripens in late summer and has yellow flesh with a pink blush. The fruit is good for canning and jam. Westcot was introduced in 1982 at the Morden Research Station. Self-pollinating but yields will be improved with a Nanking Cherry nearby. Hardy to zone 3. Finding pears that are hardy to zone 3 and still taste good, has been a challenge. Many hardy cultivars are thorny or tasteless, small with a mealy texture. Nursery catalogues might say, “for preserving”. There are a few recent introductions that are worth asking about at your garden centre, if you really want to grow pears and you are in the extremes of zone 3. Check out these pear cultivars. Early Gold is an early maturing pear glossy green-gold fruit, slightly smaller than a barlett. The tree grows to 20 feet with a spread of 16 feet. Early Gold is suitable for fresh eating, canning, and preserves. Hardy to zone 3. Cross pollinate with another pear for consistent yields. Golden spice is a thorny pear with small golden fruit that turns red when ripe, in the late fall. The fruit is suitable for preserves and canning, though not recommended for fresh eating. The tree reaches a height of 23 feet with a spread of 16 feet. Hardy to zone 3. Cross pollinate with another pear for consistent yields. How long before I see fruit? There are a lot of variables in fruit yields depending on growing conditions. Sweet Cherries seem to take the longest to yield, requiring up to 7 years after planting before the trees begin to bear well. Whereas, sour cherries and apricots may begin to bear fruit in 3 to 5 years. All the cherries named in this article are in the “sour cherry class”. Plum trees take 3 to 6 years to bear. Apples average 3 to 5 years to bear. Seedlings and whips grafted on hardy root stock can take 10 to 12 years before they begin to bear. Assuming you have the correct pollinator tree for the fruit that you have, your fruit trees should be bearing some fruit within 5 years of planting. Once they start to bear, yields will increase annually. But if you don’t plant fruit trees you won’t get any fruit. So pick your cultivars, fence your orchard, and plant your trees so that you can begin harvesting amazing home grown fruit soon. Fruit you grow yourself will taste better, and be more nutritious than anything that you can buy in the store. And while you are waiting for your trees to arrive start gathering your supplies for preserving that fruitful abundance. If you could only grow one fruit tree in your garden what would you choose? Can anyone tell me – I live in Zone 4a does it make sense that I can plant trees suited to Zone 2 and or 3? I would like to plant some fruit trees, the Harbin Pear and American Plum both of which are suited for Z2 & Z3 should they survive. Yes, if you are in zone 4 any trees that are suited to zone 3 or 2 will survive in your winter temperatures. I am in SE Montana, probably the warmer part of Zone 3, but I am really impressed with the Heyer 12 for flavor, tks Canada. Nice. thanks for sharing your experience. It is claimed that a Manchurian apricot is hardy to zone 2. I 3ill find out this winter. I’m in zone 3. I have a sweet 16, 2 year old tree, in my yard. Will a Norkent apple tree pollinate it? We live in zone 3 and I am struggling to find a sweet edible to plant next to it. 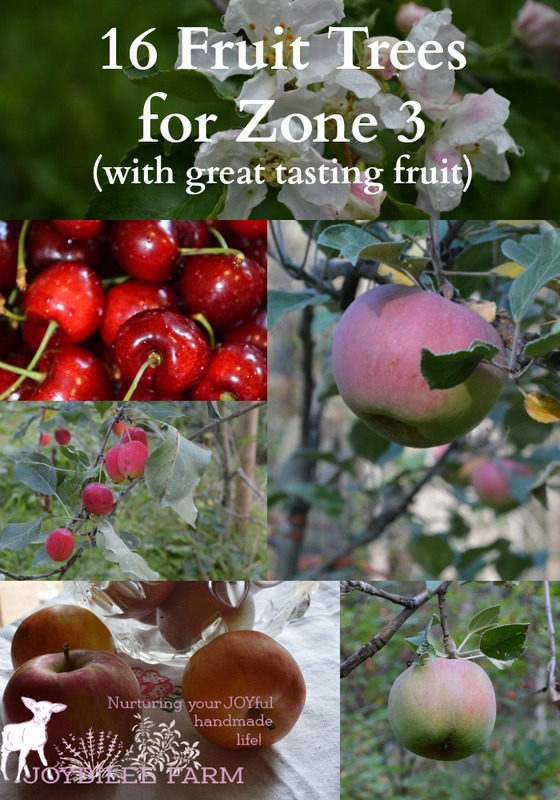 No Red Delicious is zone 4 to 9. It would struggle in zone 3 if you had a test winter. So glad to see this list. I’m in the mountains in Colorado, and we actually can be colder at 8500 ft than many places in Canada. I will try as many of these as possible and let you know how it goes! Contact your local plant retailer and find out if they order from Bron and Sons in Grand Forks. Bron and Sons is the supplier for all of these varieties in BC. Your local plant retailer can order them for you. Good luck with your search. What a great list! Pauls Pear is also a variety that does well in zone 3. Good to know. Thanks. Does it have thorns? I felt the same way when I was looking for stone fruit to plant here. There are only a few varieties that are hardy to zone 3, but you only need a few to satisfy that apricot craving in August.